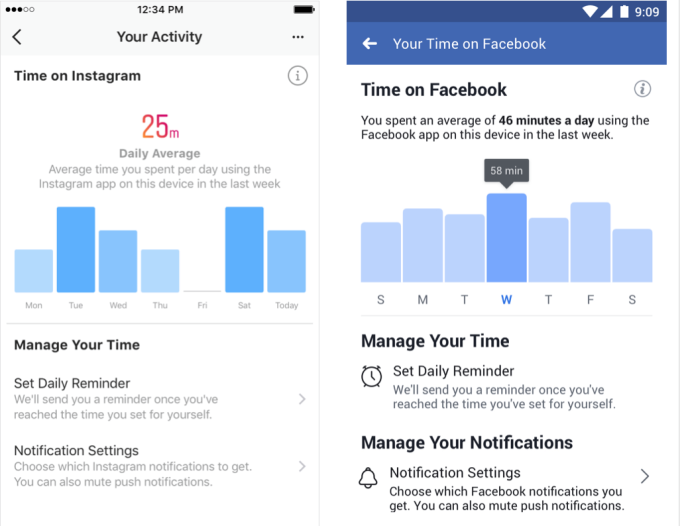 Last week, Facebook launched its “time spent” dashboard, allowing users to see precise details about their usage of the platform. The dashboard also lets users set time limits, mute notifications, and send alerts when a time limit is reached. Earlier this month, Instagram rolled out a similar dashboard, offering the same features. There’s no denying that spending too much time on social media can be harmful, but the extent to which social media itself affects most of us is inconsequential. Even still, platforms are doing their best to engender a positive, healthy social media environment by introducing new tools to the benefit of both users and advertisers. Time spent dashboards are the latest in a series of quality of life initiatives undertaken by Facebook, showcasing a renewed focus on the health and wellness of its users. From data privacy scandals to user retention issues, Facebook has had no shortage of controversy this past year. Prioritizing the wellness of its users indicates an internalization of the core critiques of Facebook — and social media as a whole — without sacrificing their bottom line. Gen Z and millennial social media users, who have left Facebook in recent years (and incidentally represent a majority of Instagram’s user base), are concerned with achieving “holistic balance” to be healthy. That includes healthy social media usage, as many millennials recognize the drawbacks of being connected all the time. For influencers, embracing the industry-wide shift towards wellness in a holistic sense can only serve to help their image. Presenting themselves as genuine people first, in light of the platforms they made their names on doing the same, can have a positive impact on how they are perceived. After a tumultuous year for YouTube’s premium services, the video sharing platform has finally decided to make its original content free. They still plan to continue supporting scripted, original shows, but will remove the paywall by 2020. Premium subscribers will still have the benefits of offline and ad-free viewing, but the original content will eventually be available to all, regardless of subscription. YouTube’s planned departure from paywalled original content is a return to form for the platform, and an admission of defeat against its chief competitors: Netflix, Hulu, and Amazon. YouTube made its millions on easily shared, freely consumed viral content. Evidently, users did not look to YouTube for paid original content. An overcrowded market for premium digital content, a misguided marketing effort, and a lack of appealing original content entrenched YouTube Premium in an uphill battle for relevance. This speaks volumes about user expectations of social media platforms, and the staying power of influencers who produce free and accessible content. While many influencers endorsed the premium model, given the prolific use of ad-blockers and YouTube’s temperamental monetization policies, one thing remains clear: free stuff is always in demand. Influencers build their brands on free output, and users will selectively (keyword, selectively) pay for premium content afterwards. The popularity of services like Patreon and FansOnly is a testament to this fact: users will spend their dollars on influencers they already enjoy. In the early days of influencer marketing, reach was the crowned king of an influencer’s performance. The logic was simple: the more followers an influencer had, the more people they could reach. The more people they can reach, the larger proportion of the target audience will be accessed. As the industry evolved, it’s become clear to agencies and brands that when it comes to influencers, there is much more than follower count. Joseph Harper, Kellogg’s head of social media in the UK, told Digiday that Kellogg’s no longer pays influencers based on reach alone. He cited concerns about how easily followers and engagement numbers are faked, and how widespread follower fraud is in the industry. Because of these concerns, Kellogg’s and other brands have started to look deeper into influencers before deciding to work with them. An influencer’s value is not just in how many people they can reach, but who they can reach and how engaged their audience is. Engagement rates aside, ensuring that an influencer matches the audience of your brand, both in demographics and geographic location, is pivotal to having success in influencer marketing. In addition, endeavoring to understand the influencer as a person, their perception, personality, and working style, can help brands find better fits. Though fraud persists on social media, it’s often left to the brand to spot the telltale signs that an influencer will not be effective at marketing. Empowering brands with metrics is the antidote to these fears. Julius offers robust data on influencer audience demographics, as well as an in-depth content search function, and vets all freelancers before adding them to the platform, to ensure brands find the perfect influencers for their campaigns. By leveraging data, both fraud and ineffective campaigns can be avoided from the get-go. Understanding who follows an influencer, not just how many people, is key to achieving that goal.